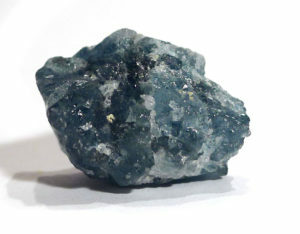 Properties: Quartz containing Lazulite exhibits the qualities of lazulite amplified by the quartz. This crystal is more for spiritual development than physical healing. It holds a sense of the sea and of detachment, and can be used for meditation and astral travel. It clears all Chakras, washing through them like water, and lights up and opens the Third Eye, and is therefore extremely useful in psychic development. It also opens the Throat Chakra and stimulates the Bindu Visarga, helping us to communicate with our Guides. If used to treat energy blockages, it can be held below the blockage. It will draw energy down through the Crown and dissolve the blockage, before working on the Chakras below it. It balances male/female energy. Lazulite Quartz possesses energies of both Krishna, which is sensual and playful, and the Hierophant, which is stern and judgmental. These energies may seem at odds with one another, but will appear separately, depending on how one works with the crystal, and can also help balance the two.